Tube Slider is a racer that is set in a future without wheels. 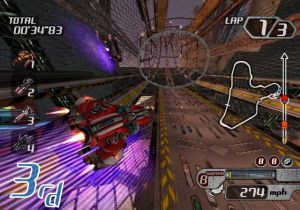 Vehicles race above the track at very high speeds, but staying on the track is not an issue as the tracks in the game are circular tubes. While the vehicles can not leave the track, they can spin out if they are not careful in the turns, twists, and bends of the courses. Racing at speeds over 1,000 mph through twisting tubes might sound like an adrenaline-packed good time, but unfortunately Tube Slider can't deliver the fun. The game comes with a variety of vehicles from which to choose, and each is rated in several categories including speed, handling, and booster capacity. It doesn't matter all that much which vehicle you select, though, as they don't handle all that differently and the races are surprisingly easy to win. First of all the controls are really simple. You have an accelerator button which you simply hold down for the entire race since the vehicles handle the same at any speed. There are side thrusters which can be fired by the L and R buttons to perform slide turns, but you really don't need them. You also have a boost button that fires your turbo for a temporary speed increase. The turbo is limited but recharges quickly once depleted, so in addition to holding down the accelerator button you'll also be holding down the turbo button, waiting for the meter to recharge, and then holding it down again throughout the race. Steering with the stick is simple enough as it is hard to temporarily spin out unless you really misalign yourself going into a bend. Tube Slider tracks include power-ups, or rather a single type of power-up and it doesn't appear that often at that. The power-up gives you a temporary speed boost and since they are grouped across the track they are hard to miss. Tube Slider also allows you to siphon turbo energy from an opponent after tailgating him for a few seconds, but you'll have little need to use this feature as you'll rarely be out of first place. One of the biggest problems with Tube Sliders is that the competition doesn't provide any challenge. In my first game of Tube Slider, I completed the first circuit by finishing in first in all three races. Most of the time I felt that I was racing alone as I rarely saw another vehicle after leaving the starting line, and racing alone is just not that much fun.